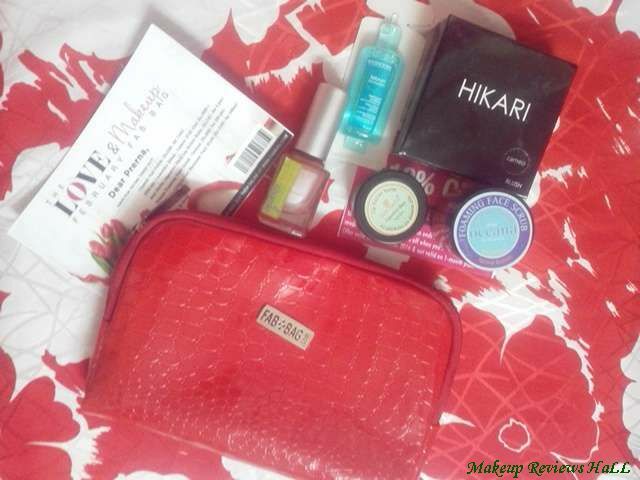 This month's February Fab Bag is little more late than usual. I received it about a week back and somehow I didn't have the time to review in between, so finally sharing it now with my lovely readers. I guess after so many posts on Fab Bag, you would have understood by now what is FAB BAG all about. Its your own personnel customized makeup and beauty box, synchronized as per your skin type and color. So without wasting any time, lets take a look at this February Fab Bag 2016. Chamki Nail Polish - Rs 250/- for 11 ml. 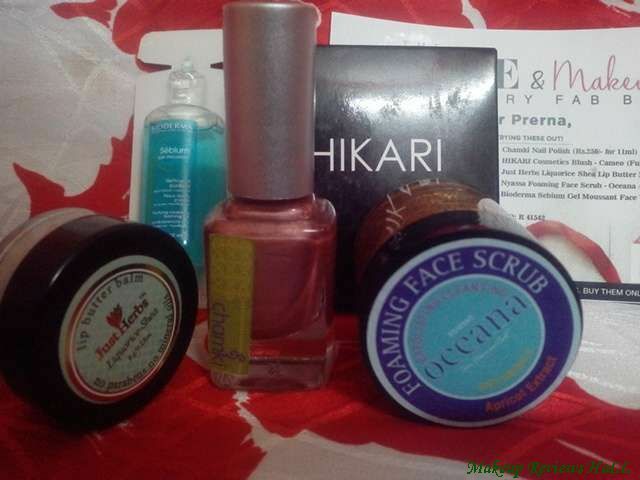 Hikari Cosmetics Blush - Cameo - Rs 1000/- for full size. Just Herbs Liquorice Shea Lip Butter Balm - Rs 345/- for 8 g.
Nyassa Foaming Face Scrub - Oceana - Rs 600/- for 200 g.
Bioderma Sebium Gel Moussant Face Wash - Rs 1299/- for 200 ml. This month's bag is quite simple, nothing extraordinary. I was expecting it to be somewhat different this time because of the valentine month. But yes I happy with the red color of the bag, since this is the first bag in red, I think. Like always there are 5 products in total, 2 being in sample size. Let me brief you about all the products individually. This is a beautiful peach pink shade nail polish from a new brand Chamki. The shade name is Begum. I haven't heard about this brand yet but looks quite worth trying since the shade is beautiful, elegant and also comes at a very reasonable price. Will surely be uploading my pictures of this nail paint on my nails very soon. I was quite happy on reading that there is a blush this time but unfortunately when I opened the packaging the pink color was all scattered everywhere. The powder from the blush just came off, don't really know how and its a total mess now to deal with. I need to clean it nicely before I start using it. So nothing much to say on this blush as of now, but will surely review after use. This is the best product of this months February Fab Bag 2016, since I have been looking for a good whitening lip balm since long. I also created my own homemade tinted lip balm, to avoid dark lips as a result of commercial lip balms but could not find any with whitening properties. I am happy to receive this since Liquorice is well known for its whitening properties and Shea butter is an added advantage for soft supple lips. I am very excited to try this butter balm as well. This is another good product, although I have received this before in chocolate variant. This time its in Apricot variant, which is amazing for acne prone skin, so I am definitely looking forward to try this one as well. Although this is sample product but I think its quite enough to feel the results and experience the effectiveness of this Apricot foaming scrub from Nyassa. Last but not the least, there is a Bioderma gel face wash. This is also a sample product but comes in a very beautiful blue colored transparent packaging. Bioderma is another great brand and I think this would be a great cleanser for people with oily skin. 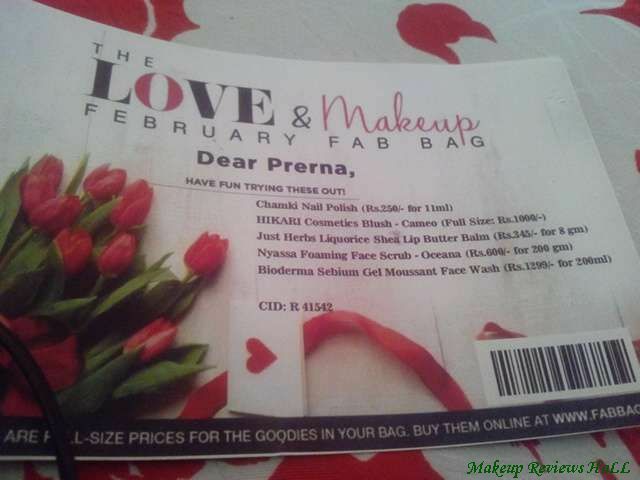 This is all about this month's February Fab Bag 2016 and I think as usual its quite good and customized but little below expectation considering the valentine month and offcourse the scattered blush was again a disappointment but I guess its very rare and happened with me for the first time in so many months. I am pretty sure they would easily replace it if I inform about it to the Fab Bag team, which I haven't yet. So this was all about this beauty bag. If you haven't subscribed to this yet, just go ahead and invite tons of beauty at your doorstep every month. Labels: FAB BAG, Fab Bag February 2016. The Feb Bag looks nice. Eagerly waiting for my bag to arrive. I liked the stuff u got, except for the nailpolish. You'e got some interesting goodies to play with !